I'm not entirely sure but I *think* spring has sprung. It's hard to tell, what with all the rain and coldness but occasionally the sun shines so I guess that's spring. I find this type of weather most confusing because you never know if it's hot, cold or somewhere in-between, as a result I've been wearing my fave Cropped Cable Knit Jumper an awful lot because it just seems to work 80% of the time. I know that generally we do Jumpers in Winter but the cropped jumper really is ideal for Spring, Autumn and Winter (and let's face it, it's very likely it'll be perfect for our 'british summer' too!) 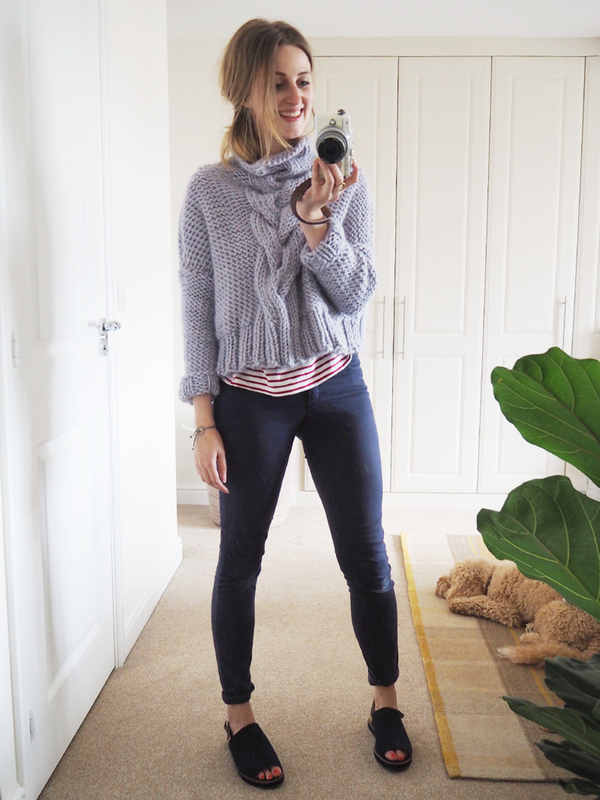 Which has lead me to todays post - Some styling ideas for your Cropped Jumper so you can enjoy it year round. I sell the Cropped Cable Knit Jumper as a knit kit (not a finished product) If you don't know how to would like to learn then there's heaps of helpful videos on You Tube, I also have a lot of tips on my knitting knowledge page and a really simple and affordable beginners knit kit available. If you don't fancy learning then I'd say it's definitely worth asking around your family and friends as I know a lot of knitters enjoy it so much but have nothing to knit so often it's not too hard to find a pal who'll give it a bash for you. This jumper is designed to be slightly slouchy and so fits pretty true to size. All the measurements are on the listing if you wanted to whip out the tape measure and be sure. When choosing my colour I pulled my favourite pieces out the wardrobe and went for a colour that would go with most of them. I was desperate to make it in Forest (the colour I eventually made the scarf in - YUM) but it didn't quite go with as many items in my wardrobe and rather than making it a stand out piece I wanted it to be a 'go with everything' number. So in the end I opted for delicious Light Grey. There are some amazing colours of the Super Chunky Yarn to choose from for gorgeous neutrals and amazing key pieces so it really depends on your go to colours and how you want to wear it. The Mink Blush is always a beautiful choice and goes really well with pinks, creams, and greens and the Granite, Mid and light Grey will go with basically anything - and of course classic black or white. If you're after a statement I think that the Lilac is beyond dreams, it'll look amazing with basically all jeans and so good with greys. And if I could just throw out the word Mustard....do I even need to say anything else?! Side Note - I've linked to all current lines but nothing old I'm sorry ...where does the time go?! I absolutely LOVE a culotte, I think they are so beautiful and stylish, day or night, dressed up or down. I have so many pairs but went for my latest culotte purchase from Zara a nice bold striped pair. The light grey yarn has a real blue tone to it which worked really nicely with the blue striped culottes (how many times can one person write culotte in one paragraph? culotte) Because I've gone quite tonal with the jumper and Culo....bottom half, I went for a bright colour pop shoe to liven it up. I try so hard not to be 'normal' for fear of it turning into 'boring' so I was really surprised when I put this one together as a rather safe option and it was perhaps my favourite! It's just so casual and comfy it's perfect for running about in the day as well as popping to the pub in the evening. Simple H&M skinny trousers, a striped tee and some open toed espadrilles along with my jumper of dreams. Sadly I don't have an endless wardrobe (or the legs to pull off short shorts and a chunky jumper) but there's some awesome inspo on Pinterest if you were after other ways to wear your jumper this Spring, I've created a whole board just for Styling your jumper (I'm obsessed!) you can see it below and simply click on it to be taken to Pinterest.... enjoy! P.S try not to be too impressed that I put a widget in my blog.... I know. I Know. Technical. Thanks for joining me, I honestly enjoyed trying on all my clothes and styling them up with my jumper so I hope it gave you some inspo and wasn't too dull! P.S did you spot Harry losing interest with each picture?